The Tiger horoscope 2016 foretells that in the Year of the Red Fire Monkey, you have a better idea about your objectives in life. You have a clear knowledge of your mistakes committed in the previous year. And you will make necessary changes to become a better person. Whatever targets you had visualized last year will be accomplished and you will be extremely happy about your success. Planet Mercury and Venus will have a great impact on the actions of the Chinese tiger sign during this period. You will be anxious and feel vulnerable. This will result in a feeling of dependence on others, and you will be weighed down by the obstacles you face. You have to take these things in your stride and by May 2016 you will come out of this feeling if you maintain your peace of mind. The 2016 Chinese astrology predictions suggest that you will find that your achievements have been excellent and you will have a reason to celebrate. All the details should be examined minutely and you should formulate your strategies in life. Do not hesitate to take risks and tackle issues with optimism. Read about Tiger as animal totems. The 2016 Tiger horoscope predicts that Single tigers will have many opportunities to form new love partnerships during the year. You should be circumspect before you get into any new relationships during the year. After the month of May, you will become emotionally stronger and you will be in a position to judge your relationships positively. Married people will face many challenges at the beginning of 2016. There will be a sense of anxiety and disappointment which will affect your emotional well-being. The Tiger 2016 horoscope predictions foretell that after April, your career will become hectic and you will be burdened with many challenging tasks. While dealing with new projects, you will be short of ideas and will not know how to proceed. If you are looking for a change of job, the month of June 2016 will be auspicious. Do not be in a hurry and examine the future prospects thoroughly before you take the plunge. June to November 2016 should be utilized to enhance your expertise and take care of any deficiencies you felt during the previous year. September to December 2016 will be a period for socializing for the Tigers. You can use this period for increasing your social contacts. This time is good for building new contacts to improve your business opportunities. The year of the Monkey 2016 predictions for the Tiger show that between May and October 2016, you will be forced to look into your long term financial planning and future expenses. You should review the fiscal situation and make necessary corrections. Pay attention to avoid unnecessary expenditure. The Chinese zodiac 2016 forecasts shows that renovation and redecoration of your home will involve major expenses during the year. There is a temptation to travel overboard while beautifying the house with luxurious items. This should be curbed to prevent unnecessary strain on the monetary budget. Planet Mercury will assist you in getting a clear idea of the fiscal state of affairs from May onwards and you can plan for the future needs. The Tiger horoscope 2016 foretells that you will be highly energetic and your vitality will be flowing in all directions during the start of 2016. It should be utilized to accomplish necessary things in a proper way. To avoid having a nervous breakdown, slow down your pace and relax sufficiently. In the year of the Monkey, tigers will need to resort to fitness training to remain in good physical health and rejuvenation. Emotional health can be improved by avoiding conflicts with others. 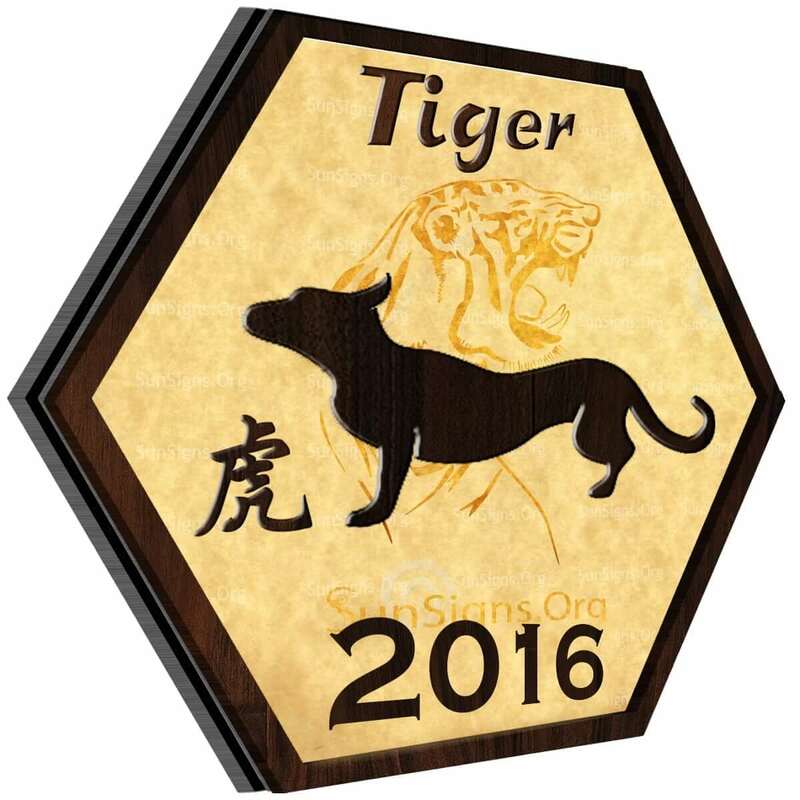 Chinese horoscope 2016 tiger suggests that July onwards you will regain your original stamina which will make you confident. You will then direct your vitality for right purposes. Diet will be important during the last quarter to enhance the health of this Chinese astrology sign. Relations with family and friends will be filled with fun and enthusiasm in 2016, predict the Chinese horoscope compatibility predictions. The Feng Shui yearly forecasts 2016 for the Tiger forecast that you might face some compatibility issues with your spouse or lover. To conclude, the Chinese horoscope 2016 Tiger predicts that this is a great time to take a break and analyze what you want to do with your life. You need to remove the emotional blockages from your life if you wish to be go ahead.